Is There a “Deep State” in Egypt? Incompetence, the struggle of a "deep state" to reassert itself, or some combination of the two? 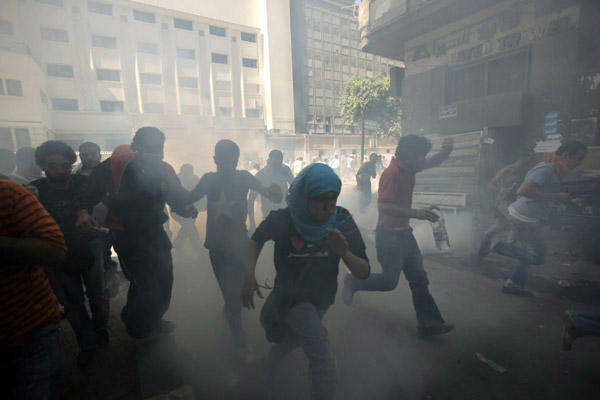 I’ve just read two very interesting, very different pieces on the ongoing revolution in Egypt. Both pieces are by freelance journalists/bloggers, and claim that there is a deep embedded, broadly distributed coterie of beneficiaries of the policies of the old regime who are perfectly pleased to see Mubarak ousted but who do not want to change the system that exists. The analogy drawn by Issandr El-Amrani in his “Sightings of the Egyptian Deep State” is with the concept of a “deep state” often ascribed to Turkey. In Turkey, “deep state” refers to the existence of a widespread coalition of political actors, mostly affiliated with the military, descended from the secret societies of the Ottoman days, who struggle to maintain autocratic power and to curb the development of real democratic change. This network forms a “state-within-a-state” and uses its power behind the scenes to control international relations and curb democratic changes that might weaken their hold on the states security apparatus and administrative branch of government. Beginning “[t]he turbulence that has hit Egypt since mid-November seems, at first glance, mostly a testament to the poor performance of the Supreme Council of the Armed Forces (SCAF) in handling the transition away from the rule of Husni Mubarak,” El-Amrani goes on to detail the multiple failures, mis-steps, violations of trust and unexpected brutalities of the various agencies under the authority of SCAF. El-Amrani is far better than most writers at reminding us again and again that SCAF is a divided group whose members may have multiple, cross-cutting loyalties, that the same is true of the current appointed government, and that there are multiple security agencies which do not seem to be operating in tandem. Apart from gross incompetence, the army’s actions have another explanation: reassertion of a “deep state” that was badly bruised during the January uprising and took some time to regain its footing. While the army may be the bedrock of the post-1952 Egyptian state, the country’s array of security agencies crosses the boundaries between civilian and military. The Ministry of Interior’s agencies were particularly battered by the uprising and the fall of the ex-minister, Habib al-‘Adli, who had amassed unmatched clout in his long years on the job. It is not clear who controls the Ministry today, but it is almost certain that the police veteran in charge when the wintertime clashes broke out, Mansour al-‘Isawi, was not master of his own house. Scholars of Turkey are divided about whether the “deep state” should be taken as a useful concept for talking about networks of people who come together due to confluences of interest or whether it refers to an actual organized group. The latter smacks of conspiracy theorizing, but it is a position held by many Turkish politicians including the current prime minister Recep Erdogan. The same conundrum faces us if we ask about the utility of “deep state” for Egypt. In a pithy forthright column on fikraforum.org, Magdy Samaan argues that Egypt’s regime has a kind of “deep state” (although he does not use that term), dating back to the original revolution of the Free Officers in 1952. This revolution, he writes in an essay entitled “Who are the true ‘fulul’ of post-revolutionary Egypt,” produced a broadly distributed, deeply sedimented “system of patronage and loyalty” rather than direct military rule. Following the Free Officers’ revolt against civilian rule in 1952, the military sought a purge of social agents who had themselves been tapped by the proponents of the liberal trend which led the 1919 revolt, and which the Free Officers viewed as unrepresentative of society as a whole. The July officers sought to distribute wealth and influence more evenly and aimed to design a new social network, one founded on loyalty to them. In Samaan’s argument, Mubarak betrayed not just the people of Egypt by consolidating power in his own hands, but the regime deep state (which he calls “the Old Guard”) by shifting patronage to those personally loyal to him, bringing in a new business elite into places of power, and annointing his son as heir apparent to the presidency. This prompted the ascension of new beneficiaries, professing loyalty to the heir apparent and triggered resentment towards the Old Guard, foremost among these the military establishment. An unspoken power struggle ensued between these two camps. The civilian heir was a feckless and unconvincing candidate, particularly in the eyes of the military. Similarly, the Old Guard questioned the share of the political pie accorded to these ‘new upstarts’ – most of whom were businessmen – and disputed their administerial competence, embodied in the person of Ahmed Ezz, former Secretary of Organizational Affairs for the NDP. In Old Guard circles, the resentment grew. The popular intifada against Mubarak’s rule initially came with the blessing of the military, which saw in the uprising an opportunity to rid itself of a source of irritation, namely, the idea of hereditary succession of power. Although the military establishment – which otherwise represents the solid core of the previous regime – initially aided the revolutionaries and assured them that they would relinquish power to civilian forces, subsequently created in the months following an about-face scenario which would preserve the old balance of power and its beneficiaries and restore military control. The SCAF deliberately utilized the security vacuum and the dire economic situation to play on the ordinary citizen and intimate that the revolution was responsible for these. In the last three months, the military establishment has made its antagonism to the revolution and its instigators clearly known, with accusations resurfacing from the first days of the uprising that Tahrir Square does not represent Egypt and that activists are funded by outside sources bent on wreaking havoc, and so on. Interestingly, both authors end on optimistic notes, persuaded that the constant and continuous pressure put on the military’s forces by the many hundreds of thousands of Egyptians who continue to resist, and resist, and resist, at continued peril to themselves. Another sighting of a “deep state” argument: Ashraf El-Sherif’s article “ The secret group ruling Egypt,’ the deep state and its collapse” in Egypt Independent Jan 25. El-Sherif points out that as early as 1954, two years after Egypt’s first revolution, political journalist Ihsan Abdel Qoddous wrote an article titled “The Secret Group Ruling Egypt” that argued the Free Officers and the Revolutionary Command Council formed a state within a state that made the “discussions about the constitution, presidential powers, secular-Islamist divisions, as well as other noisy” political debates irrelevant. In its desire to reproduce the old regime, the military’s “deep state” needs a popular front represented by an elected parliament and president (even if the elections are nominal and in fact the current electoral process is far from being democratic) in order to handle public services. Dossiers related to major economic interests, foreign policy, strategy and security will, however, remain under the grip of the military. He argues that even if the new elected Parliament and president are not corrupt, as the old regime was, if real power rests in the hands of a deep state, the goals of the revolution will not have been met. “Cairo’s Undercover Strongman” also by Magdy Samaan in the Foreign Policy blog offers a profile of Murad Muwafi “the most important man in Egypt you’ve never heard of.” It’s a “power behind the throne” piece about the guy who replaced Omar Suleiman as Egypt’s spymaster. Not exactly a “deep state” argument so much as a revelation on one of the most powerful, low-profile figures making decisions in Egypt. If there is a deep state, this article suggests Muwafi would be part of it.